A former ranking prosecutor was sentenced to two years in jail Wednesday for unfairly disadvantaging his female junior colleague after she raised sexual misconduct allegations against him. 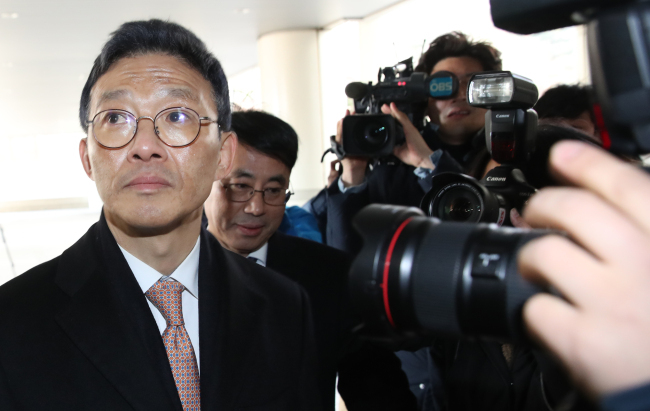 The Seoul Central District Court handed down the guilty verdict to Ahn Tae-geun, who last held his job as chief of criminal affairs at the Ministry of Justice. Ahn was immediately taken into custody after the court ruling. Ahn, 53, was indicted in April last year for abusing his authority to have Seo Ji-hyeon, a district attorney then based in Tongyeong, transferred to a position outside of Seoul because she accused him of sexually harassing her. The allegations were highly publicized early last year as Seo came forward with her claims in a television news interview. She accused Ahn of groping her during a funeral dinner in 2010 and when she sought to formally raise the issue with the internal affairs bureau, he pulled strings to have her moved to a post in a regional prosecution office. The scandal triggered the "Me Too" movement in South Korea, sparking a raft of revelations from alleged female victims in the culture, arts, education and religious sectors. Prosecutors have charged Ahn only for abuse of authority, since the statute of limitations has expired for the sexual misconduct allegations. The request for Ahn's arrest was turned down by a court in April due largely to disputable grounds.